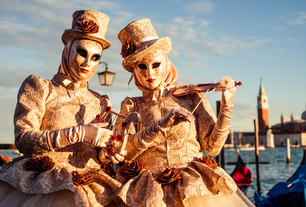 Beat the winter blues with Italy Tours and Italy Vacation Packages to Venice for Carnival, when the ancient city comes to life with masqueraders, pageantry, and celebration. Taking a trip to Italy to witness and participate in this spectacular annual event will make you forget all about the coldest season of the year. 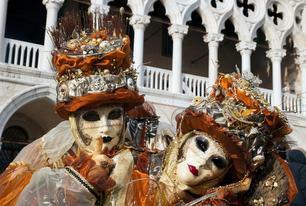 The Venice 2015 Carnival runs this year from January 31 to February 17. Fun and creativity run rampant in the city of canals during Carnevale Venezia, a centuries-old tradition that draws thousands and thousands of visitors. There is no charge for the street festival portions, which are all free, although there are private parties and other related events that cost. Admission varies depending on the event, with art shows and concerts quite reasonable whereas the elite balls are extravaganzas starting at just under $1,000 US per ticket. Even if you’ve been on holiday in Venice before, this incredible festival reinvents the city into something magical and different. The crowds of party-goers, festivities, and street buskers make taking a trip to Italy for Carnevale uniquely different from any other trip to the Bel Paese (beautiful country). The full schedule of events for Carnevale 2015 is a whirlwind of activity and spectacle billed as, “The world’s most delicious festival!” Given the stunning, colourful costumes, delicious Italian food, and world-renowned wines available to those who attend the Venice Carnival we have to agree. While there are of course new and interesting things to do in Venice during Carnival each year, there are annual events that are integral to the tradition of the event. These include the Grand Opening on January 31 and the water parade of masked revellers aboard canal boats on February 1, just two of the 72 highlight events. One of the most popular events at Carnevale is the much-loved volo dell’angelo (flight of the angel) when a stunning Italian beauty dressed in a gown from the Serenissima period will fly, delicately dangling from a zipline, from the bell tower of San Marco over the crowd gathered below in St. Mark’s Square. If you enjoy rich period costumes and recreated history, the volo dell’angelo is exquisite. Another immensely popular event is the contest for the year’s best masked costume, also in St. Mark’s Square. Throughout Carnevale there are competitions for the best carnival costume each day, with competitors decked out in their finery, wigs, masks, and everything from ribbons to sparkly jewels vying for people’s choice this year at 11 a.m. and 3 p.m. daily. 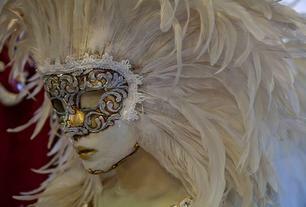 The main event, of course, is the contest for finest masked costume of Carnevale. There’s more than just rivalry between well-dressed masqueraders for entertainment in Piazza San Marco (St. Mark’s Square); partygoers will enjoy live music and more. This year’s featured entertainers are the Nagasaki Dance Company with their “Lindy Hoppers” dance show and Huma Show Entertainment’s “The Missing Link” flying circus spectacular. 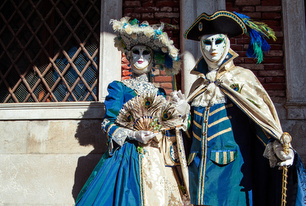 Perhaps one of the most enjoyable aspects of Carnevale Venezia is that everyone is invited to join in the merry-making. After all, what’s the fun of sitting on the sidelines? Young and old, Italian and non-Italian, everyone gets into the spirit of dressing up in disguise. Children and families delight in all sights and scenes of the Venice Carnival as much as young singles and couples. There really is something for everyone to enjoy! As you explore the streets of Venice you’ll find mask shops everywhere, with some stores of course selling cheap knock-offs and others fine Italian-made masks crafted by gifted artisans. You’ll find everything from traditional plain white Venetian voltos to stunningly vibrant and detailed mascarei. What to wear? Come as you are with just a mask to hide your identity, dress up in historical costume to get into the spirit (and maybe entered into the daily contest! ), or wrap yourself in a voluminous Venetian-style cloak for dramatic effect that also keeps you toasty warm. When in Venice for Carnevale there are still historic areas and hidden sites to discover with Avventure Bellissime’s Venice Walking Tours. If you can make the time to explore the surrounding area, our Venice Day Tours and Excursions include trips to the spectacular Dolomite mountains or through the Veneto wine region. To book a trip to Venice or for other inspired Italy vacation ideas,visit Avventure Bellissime online now to build your Italy vacation packages.